Submitted by Mike Penn on 10 December 2018. This is the second of five "Meet the Scientist" journal entries featuring the members of the intrepid Automatic Weather Station crew. Have you been wondering who is with me here in Antarctica? Have you wondered how these people became scientists and what kind of experience and qualifications they have in order to get here? "Meet the Scientist" should answer those questions and more. Forbes Filip is the AWS team's Field Engineer among many other jobs he has to do here in Antarctica. Forbes is the youngest member of our team at 24 years old. In his 24 years, he has proven his skills are up to the task to be here in Antarctica as a member of the AWS team. At the heart of an AWS is a complicated electronic brain called a 'Data-logger.' (Essentially it is the thing that all of the sensors are hooked up to.) 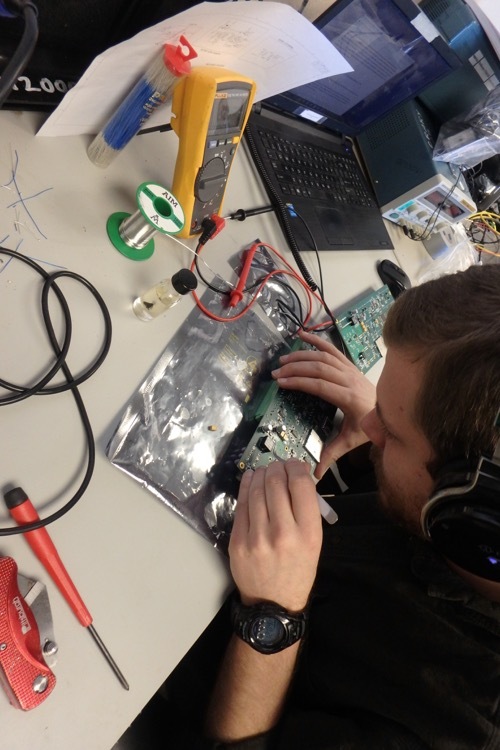 The data-logger board takes the data from the sensors and it then communicates with satellites in space to send that data back to the University of Wisconsin. Forbes was part of the design and testing of the hardware of the units. That testing included putting the data-loggers in extremely low-temperature freezers to make sure they would work in the extreme Antarctic conditions. His workspace in Crary lab is neat, tidy and circled with complicated looking pieces of testing equipment. 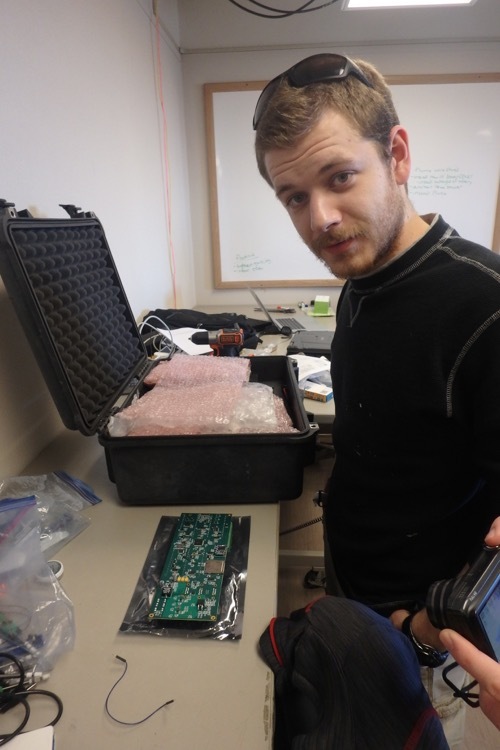 Forbes Filip working on electronics that will be installed in AWS in Antarctic. An interesting insight into the way Forbes thinks and his sense of humor is the fact that he thought to bring a bunch of memes to pin to his bulletin board. He is quiet and when he does speak it is usually something very witty. As an example, we had dinner with one of the weather forecasters who had recently been less accurate than he had hoped on the previous night's forecast. Forbes quietly said that the forecaster might be demoted to a "three-caster." Forbes Filip can often be seen working with impossibly tiny resistors in his work as Field Engineer on the AWS team. 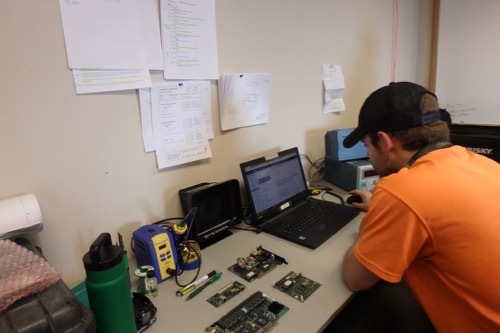 Forbes Filip is a field engineer from Madison College working alongside the AWS group from the University of Wisconsin’s Space Science and Engineering Center. He started working with the AWS team in early 2017 on the development of new datalogging equipment for the UW Madison AWS systems as part of an honor’s project. 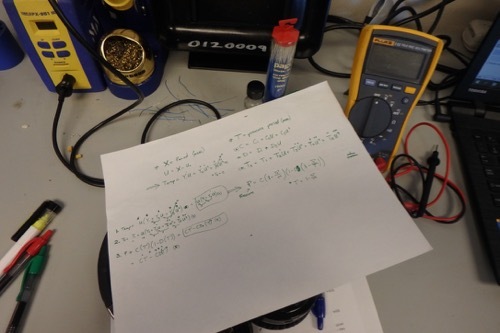 These are the notes and calculations that Forbes Filip works with as "Field Engineer" He is currently getting a bachelor’s degree in Electrical Engineering at Milwaukee School of Engineering. Forbes has worked in engineering manufacturing and design engineering in Wisconsin for two years. He enjoys designing and building circuits...and he is a good guitar player too! You are working with people younger than your oldest. Interesting perspective for you I am sure. Greta, You are right! Forbes is 24, Elina is 25, Dave is 27ish and Lee is 34. So even Lee is younger than Kurt! Actually, it has been a while now that I'm generally the oldest person around. At school and even at home, I'm the oldest! And I'm a whopping three months older than you! What kind of perspective would you take to do Forbes job. Adrianna, I'd love to answer your question, but I'm not sure what you mean. Are you asking what kind of training/schooling/experience does he have? Please respond and clarify your question and I'll ask Forbes. He would be happy to give guidance on how to get where he is now! As always, thank you for reading my journals and taking the time to ask a question! Keep them coming!